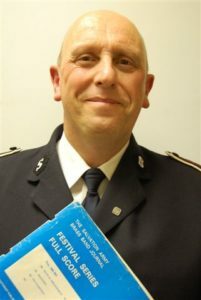 The South London Fellowship Band (SLFB) was formed in 1994 on the initiative of Major George Whittingham, a retired Salvation Army Officer, a former Deputy Bandmaster of the International Staff Band and, for many years, Bandmaster of the Upper Norwood Band of the Salvation Army. Major Whittingham saw an opportunity to create a further avenue of service and fellowship for Salvationists and other Christians either approaching or already enjoying retirement. The band brings together a wealth of commitment and many years of service resulting in a group of players who strive to achieve high standards of Christian discipleship and musicianship through which Salvationists and friends throughout the wider brass band movement can be reminded of and learn more of the rich heritage of Salvation Army music. 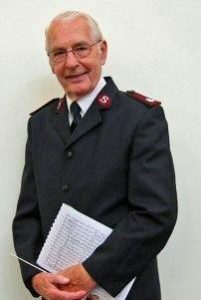 Following Major Whittingham’s retirementfrom the band in 2013, at the age of 87, Darrell Scholes became conductor of the band. The Band currently numbers over thirty personnel drawn from thirteen Salvation Army corps and has undertaken away weekends and visits to a large number of corps extending from Plymouth Exeter Hall in the south-west to Aberdeen Citadel in the far north of Scotland. In addition to the Band’s own soloists, festivals have been graced by a number of special guests including Brett Baker, David Daws, Derick Kane, Carl Nielsen and the late Maisie Wiggins as well as ‘up and coming’ players such as Tom Neilson. One of many highlights over the years for the Band was a Composers Festival in 2011 when the music of three English SA composers was featured in a programme conducted by the composers themselves, all of whom were living in the USA at the time: Lieut. Colonel Norman Bearcroft, Brian Bowen and the late Major Terry Camsey. The Band undertook it’s third tour, visiting a number of Salvation Army centres in the Netherlands, in June 2017. Previous tours were in 2003, to the north of England and Scotland, and 2013 visiting corps in the Midlands and Norfolk. The Band has a wide and varied repertoire and tailors its programmes to suit the varied venues at which it is asked to play. There is however always a core of Salvation Army music, both ancient and modern, which has included works regarded as classics of the genre such as The Old Wells, Resurgam, Lord of the Sea, The Triumph of Peace and Song of Courage. The Band maintains contact with its retired members and supporters through this website.